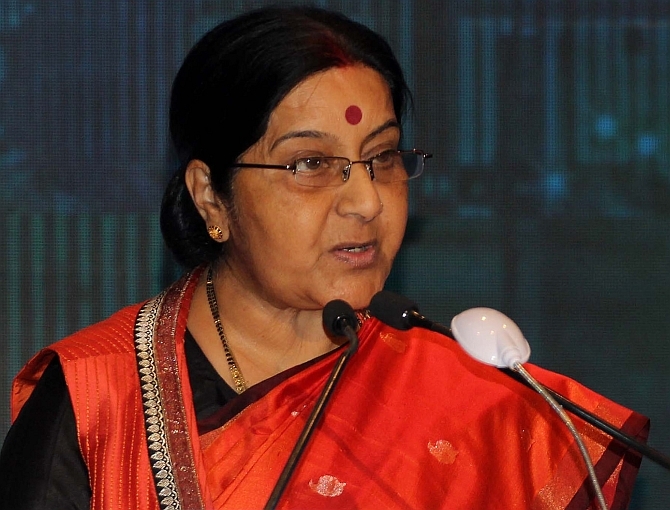 Union minister Sushma Swaraj on Sunday launched a veiled attack on Meira Kumar, the Opposition’s presidential candidate, by posting a video of a 2013 Lok Sabha speech in which the former Speaker was seen repeatedly interrupting the then Leader of the Opposition. Swaraj had accused the UPA government of corruption in her speech. 'This is how Lok Sabha Speaker Meira Kumar treated the Leader of Opposition,' Swaraj tweeted, along with a link to the over six-minute-long video of her address in April, 2013. Swaraj was seen as questioning the neutrality of Kumar, pitted against BJP-led National Democratic Alliance candidate Ram Nath Kovind for the presidential contest. The external affairs minister also tweeted a link to a newspaper report with the headline 'Speaker interrupted Sushma 60 times in 6-min speech'. Swaraj, as the then Leader of the Opposition in the Lok Sabha, had lambasted the Manmohan Singh-led regime on alleged financial scams, calling it 'the most corrupt government' since Independence. In the video, Kumar repeatedly said 'thank you' and 'all right' to Swaraj, indicating that the MP had to cut short her address. Swaraj had later said the Speaker did not 'protect' her when a number of senior ministers raised a ruckus during the speech. The Opposition last week named Kumar, a Dalit leader from Bihar and former minister, as its candidate against former Bihar governor and Dalit activist Kovind, who was likely to succeed Pranab Mukherjee as the president because of the National Democratic Alliance's strength in Parliament and state assemblies. The daughter of the former deputy prime minister, the Jagjivan Ram, Kumar, 72, was also the first woman to be made the Lok Sabha Speaker, a post she occupied between 2009 and 2014, during the United Progressive Alliance's second term.